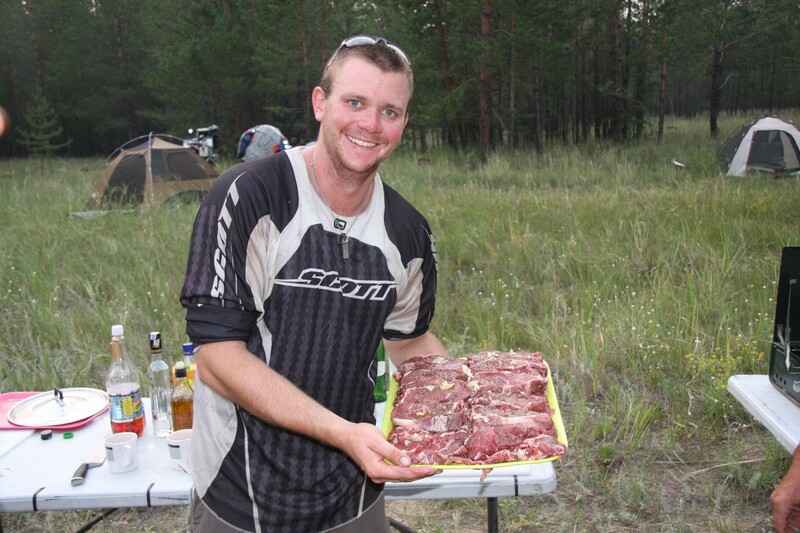 104 days, 28,000 km and eleven time zones … Russia is BIG. 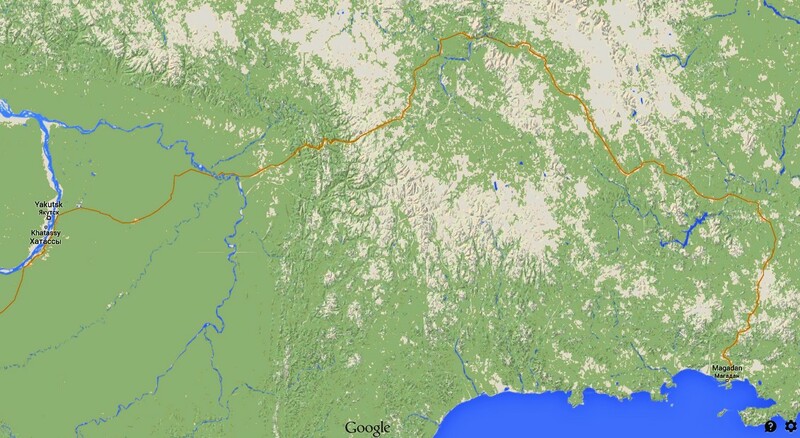 The last segment of the journey is the Road of Bones, which runs 2,000 km from Yakutsk to Magadan, see map below. It is the only road in the area. They rode this in 7 days; they had to repair 18 punctures, yes eighteen, of which seven were on the last day. 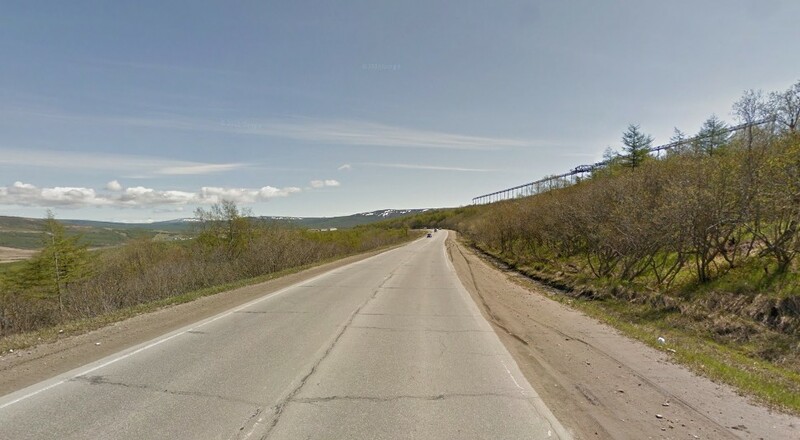 I have been following the Spot Trackers that are attached to two of the motorbikes, notably yesterday when I watched minute by minute as the bikes came down this last segment of the Road of Bones into Magadan. Sitting safely at my computer, I played my favourite music from my 2012 trip, and drank much vodka as I saw the trackers enter the city. When I did this ride in 2012, after 26,000 km I found I had acquired the stigmata of Jesus Christ. Google Earth have done the Street View for every road in Yakutsk, even the cart tracks, and are working on Magadan now. They obviously fly their apparatus in, and hire a car to attach it to. So far they have only photographed the major roads of Magadan itself. This is the Street View where the bikes all stopped, at the end of their journey. Well done, guys and gals. But that is the view looking back up the Road of Bones! With great emotion, and another vodka, I swept the Street View around to look towards the city. 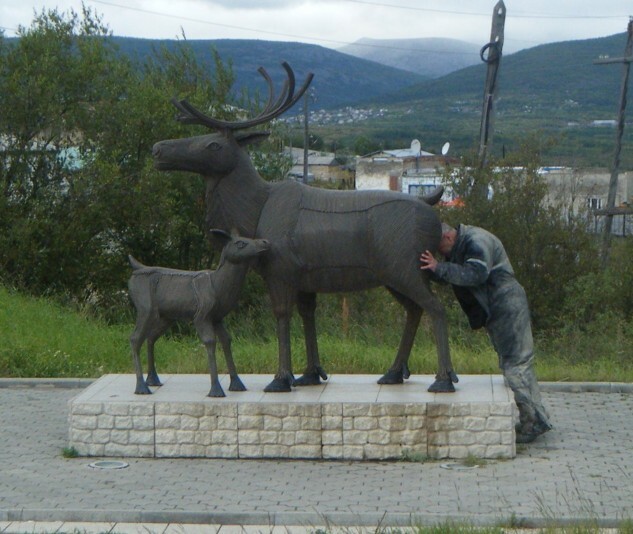 There’s the Magadan city marker. and to its right the city mascots, a deer and fawn. I recalled how, in 2012 my great friend Deany was very glad to see these. He’s from New Zealand. Of course the Road of Bones is tarmac around here, but it’s gravel and impacted mud for 3,170 of the 3,177 km from the M56/M58 junction at a town called, would you believe, Never. Here’s me two years ago, at Never – Great Never, to give it its full name – grinning because I have not yet done any of the 3,177 km when Hugh took this picture. And here’s me two days later. As you see, conditions were somewhat muddy. I actually cannot tell if this is me or Andrew, who had a similar red jacket. And the bike is also pretty hard to identify – we all had BMW’s – but the missing front mudguard (compare with the bike behind) shows it to be my bike. Nearly everything on it got broken or damaged, but it always went perfectly. I did not get around to getting the bike repaired until mid this year, 18 months later, and now it has been 12 weeks in the repair shop; it is still there, and the eventual bill may reach $6,000. 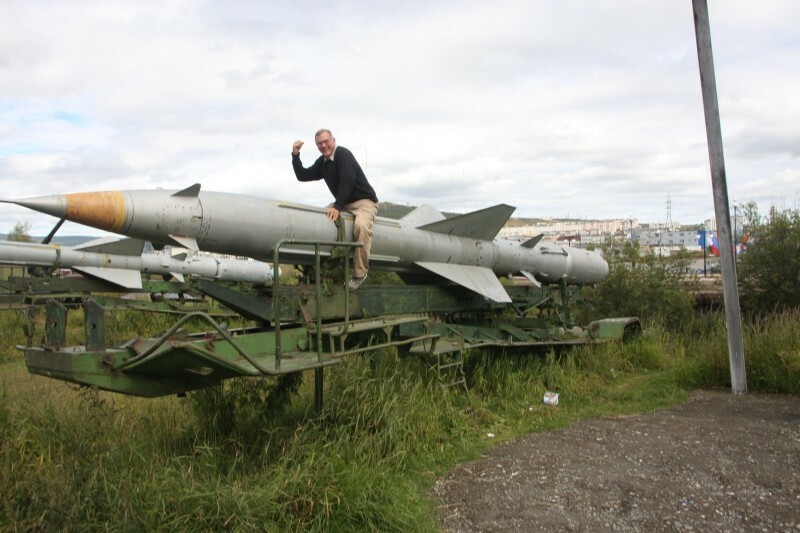 Magadan has a kids’ playground, which has no swings or roundabouts but it has a tank, APC, field guns, radars, two fighter aircraft, and two SA-2 missiles. A playground for kids of all ages. Toys for boys. Boys, who one day might grow up, but until then, at least this stuff can rust in the playground. 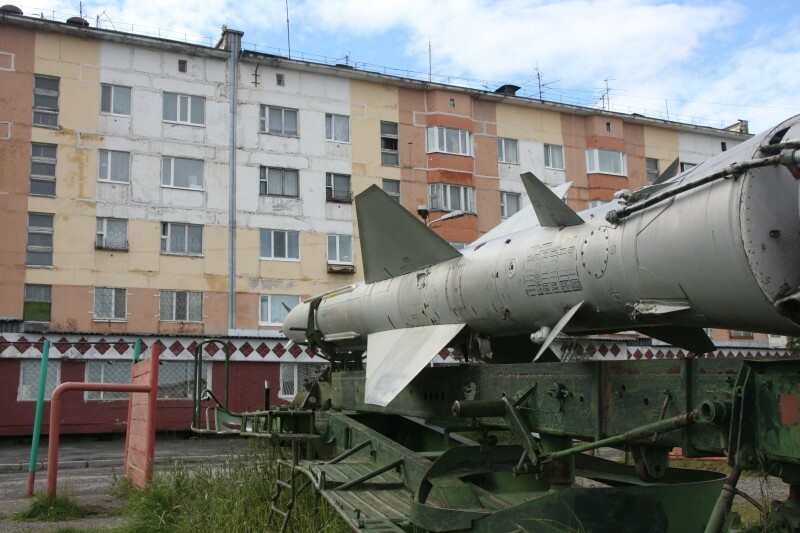 In appalling taste, the SA-2 missiles are aimed directly at a nearby block of flats. I hope they reduce the rent for the rooms directly in the line of fire. And now it’s 2014 and the expedition has made it safely again. Well done, guys, gals and Compass Expeditions. When I mention my incredible 2012 Road of Bones trip, people often ask: which was the best/worst country for sausages, or whatever. So here is my list. Worst driving: Austria and Switzerland, where the freeways have no speed limit, so a couple of seconds after you have checked your rear-view mirror and seen an empty road behind you, a fast-moving car is right up your bum. And such cars are driven diabolically and aggressively. In contrast, just about everywhere else had good, considerate drivers – yes, even Uzbekistan, except in the traffic jams. The driving was markedly more aggressive when we got to near to, or in, a city. Worst traffic jams: Uzbekistan, where we took a couple of hours to go 500 metres – some of us went into cafes and had a coffee while our vehicles waited. Uzbekistan is so hopelessly mis-managed as a country that the police do nothing. There were some whopping traffic jams in big cities such as London, Munich, Bishkek, Samara, Almaty, Ulan Bataar but this is probably normal for a big city and we could generally filter between the cars, although riding on the pavement in Ulan Bataar got some bikes into trouble. The ring road around Bucuresti was jammed solid, we drove in the ditch to avoid it, narrowly missing several prostitutes who ply their trade at the road side (there often being enough time for a quick one before your vehicle has a chance to move). Rudest service in a shop: Britain. 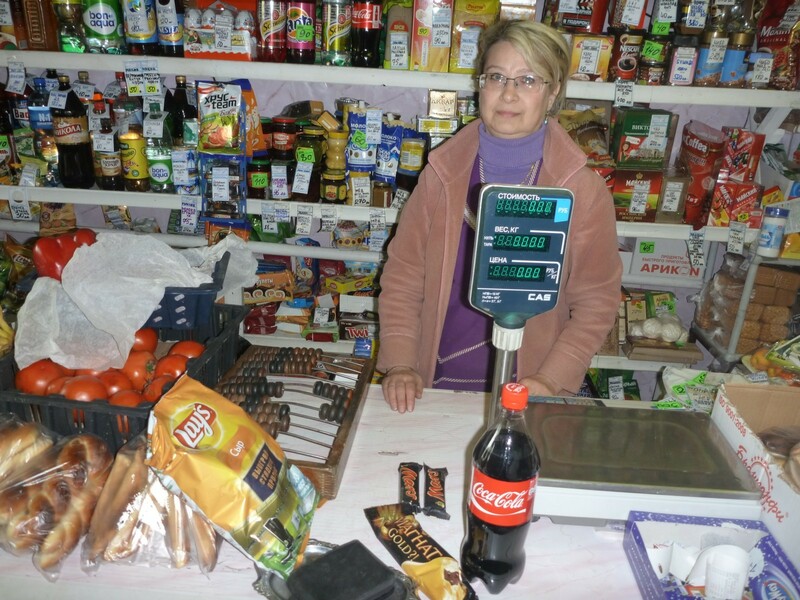 I know customers disturb the smooth running of a business, but I experienced instances of apathy and downright rudeness that not even the Russians could equal, and by golly a handful of Russian shop assistants tried pretty hard. Biggest rip-off for Internet access: Britain again, where we had to pay for it; everywhere else, it was free (if available at all). Kazakhstan and Uzbekistan censor their internet access, which made it impossible to update this blog, among other silly side effects. Worst roads: Here Mongolia takes the cake, there being no roads at all over much of the country. The scenery and feeling of freedom more than compensates for the difficult tracks we rode. It is 140 km from Jargalant to Tsagaan Nuur, it took all day and I rode it all in bottom gear – yes, it was a Day with No Gear Change. 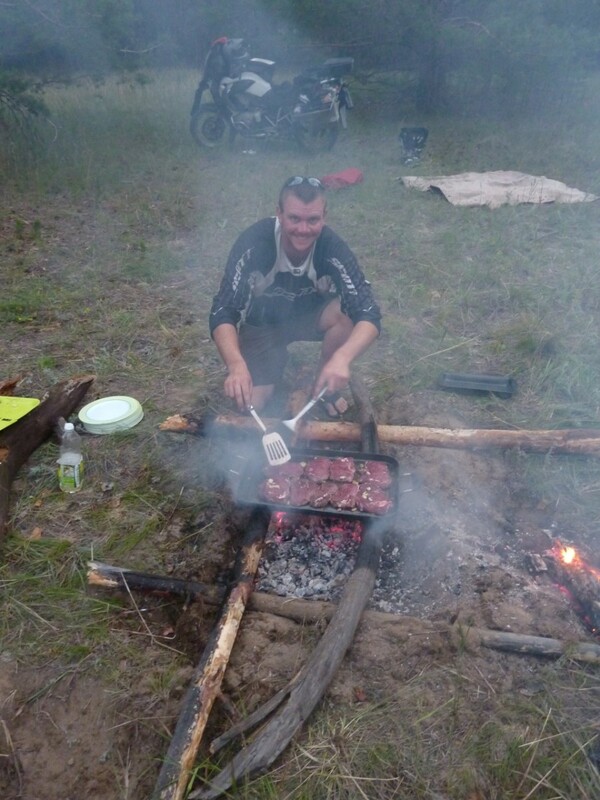 Best food: The best meal we had IMHO was at the camp at Semey, Kazhakstan where Millsy, who once trained as a butcher, cooked steaks over an open bonfire. 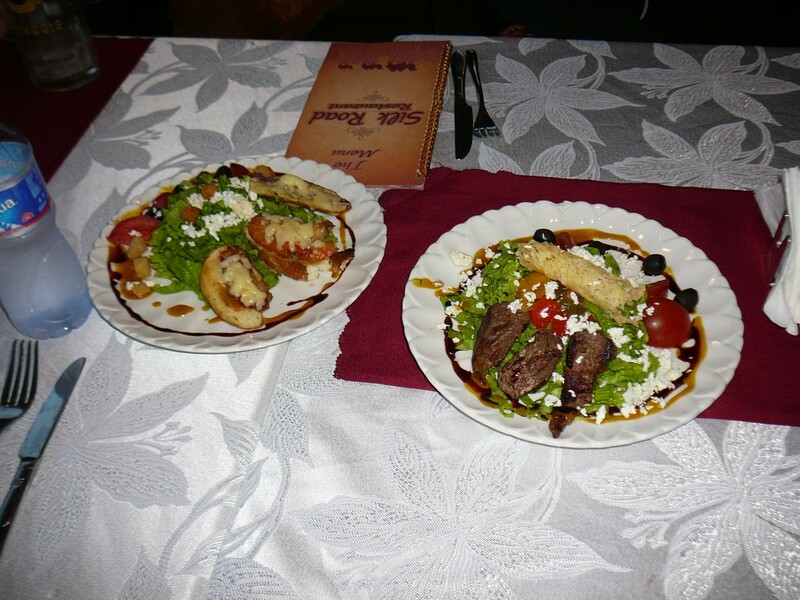 Worst food: Well we got a bit tired of Siberian potato soup, but the only meal that caused a big problem was in either Austria or Switzerland, where several people had to stay behind for a day with severe food poisoning. Apart from that, even in the wilds of Kyrgyzstan, even in remotest mid-Siberia, nobody had any problems with their digestion. Grottiest hotel: a few candidates but it must be remembered that for 30 nights we did not have a hotel at all, or even a building in sight. The longest and most unpleasantly clumsy check-in process was at the only 5-star hotel we used, the Marriott in Irkutsk. A ghastly hotel is still a welcome sight after a long day’s ride, but the hotel in Russia that had no water at all, and I had spilt Coca-Cola over some of my clothing, was the very pits. 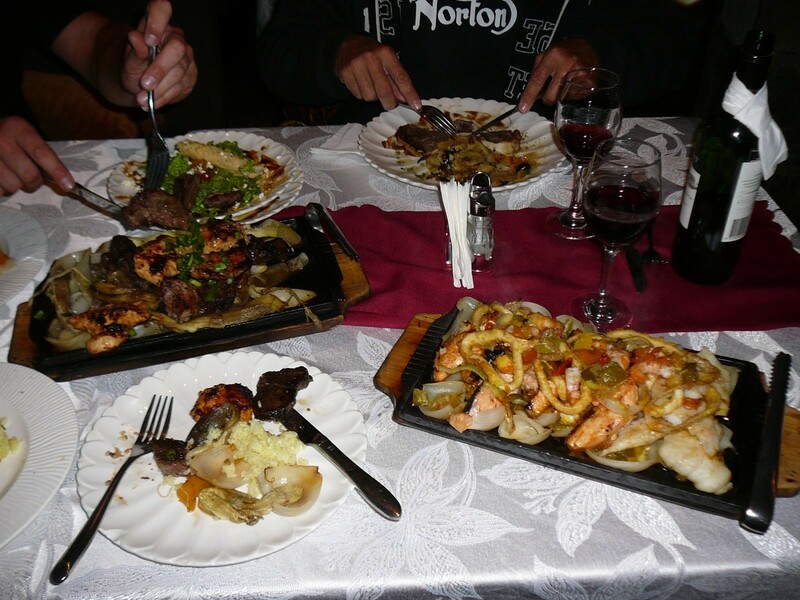 The hotel we most enjoyed coming to, was the Fairfield Hotel and bakery in Tsetserleg, Mongolia, with wonderful food and Westernised rooms, after like 10 nights camping (sometimes in ger camps, sometimes in the bush). Unfortunately my wife saw this picture, which shows that I was buying Coke, Mars bars, ice cream, chips etc when there were very nice tomatoes and capsicum and bananas etc on sale. Moral: be careful what you photograph. These are the accessories I fitted to the motorbike, or bought and took with me, on the 18-week Road of Bones trip last year. Well, how useful were these things and how well did they stack up? So here’s my take on what I chose to fit/buy and how each thing performed, including the stuff I didn’t have, or did have and had lost them or thrown them away. 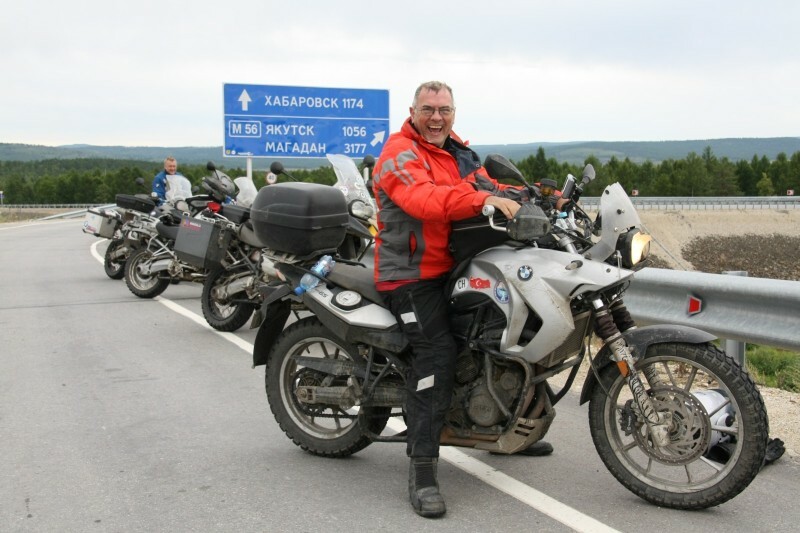 I bought a new BMW F650GS specifically for the 104-day, 28,000-km trip, and rode 10,000 km on it before the start, to familiarise myself and to kit it out with what I thought would be useful accessories. 20 grand for a new bike, hat, coat, GPS, cruise control and a few accessories’ but the trip itself cost $30k (paid to Compass Expeditions) plus another $30k on top for contingencies & spending. Plus, if one is working, 5 months’ wages lost. The bike performed admirably well, except for a broken headlight globe on day 98, by which time a lesser bike would have been smashed to pieces by potholes, corrugations and other impediments. Crash bars – essential, as I dropped the bike a few times, mostly at very low speed where I have poor skill at balancing it. One of the more fun times was in Kazakhstan when I came back to the tarmac road after a long diversion on the dirt, the road being at right angles to the track, and the sand had carried onto the tarmac, so when I surged out and did the right-angle turn the bike just kept on turning, and did a 360 as I stood up with the horizontal bike between my legs. Picked it up and rode off. 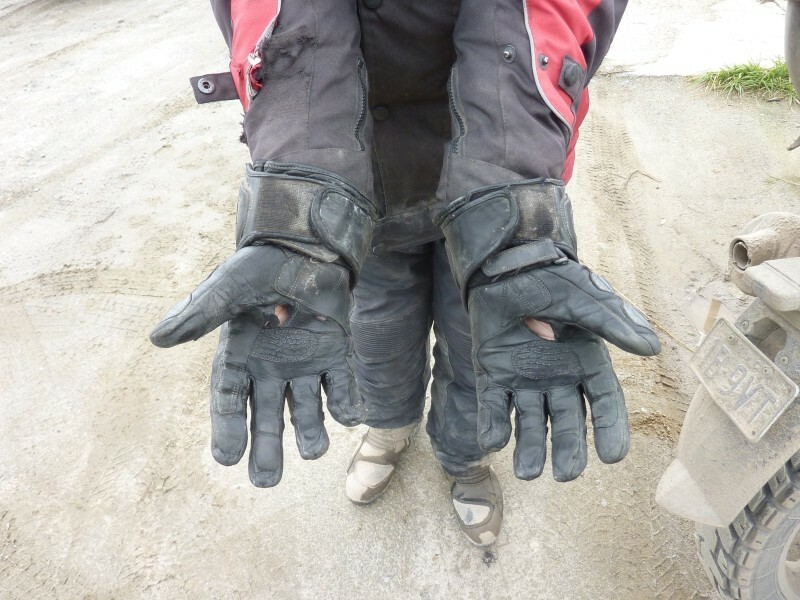 Sump guard (bash plate) – essential in places like Mongolia where there are no roads and you ride on dirt and stony tracks. You can hear the stones hitting the plate, and I counted 33 in one day. I extended the bash plate upwards to cover the F650’s heat exchanger, but this worsened its negative aspect, which was that mud collected between the plate and the engine and made it overheat. It was quite difficult to get the mud out, with a car-wash hose. Handlebar shields (barkbusters) – essential, as one unlucky stone can smash your fingers. They also preserve the brake and clutch levers if you drop the bike, and keep cold air off your fingers. Tank bag – RKA make a robust bag that fits the F650’s volcano-shaped “tank” (which is actually a battery cover; you are sitting on the fuel tank). This was vital for holding my great big Canon 40D SLR camera; wearing gloves & helmet I could get the camera out, take a shot or two and put it back within 30 seconds, well within the time of a red traffic light. Rear Top Box – I had a rather unwieldy looking Givi 35-litre box, enough for the laptop computer, a set of clean clothing, and the toothbrush. Thus, I was able to survive a night in a hotel away from the group, which happened a couple of times when some of us got ahead or behind the others. The Givi mounting was only plastic, not really designed for Russian roads and it sheared off in Samara, but I held it on firmly with two straps, which are still in place. Front fork gaiters – otherwise squashed flies on the forks will be rammed down into the oil seals whenever you go over a bump. In Russia I had the forks hitting the stop nearly every day, potholes in tarmac are much worse than potholes in dirt. Radiator protector – not much use; it is supposed to keep stones off the radiator but if a stone would damage the radiator, then a slightly bigger stone would damage it through the protector. 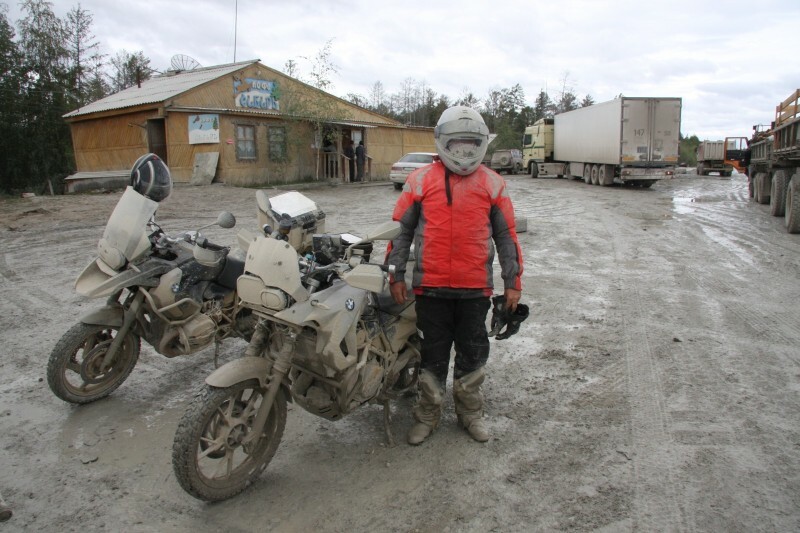 Worse, it held mud in place against the radiator so the bike overheated badly on muddy roads, and we found that in places like Siberia where the road was muddy, then everything was muddy, and there was no water lying around. Windshield extension – nice to have, as it swept the air higher and thereby reduced helmet noise, but I had a bit of a prang on day 41 in Tashkent, after which the bike’s headlight and instrument cluster were (and still are) held on by cable ties. The windshield extension increases the stress on these, so I don’t use it now. Headlight protector – I did not have this, but some riders fitted a metal grille that would keep stones off the glass. Brake switch protector – the 2010 RoB trip was marked by engine stoppages due to stones hitting the kill switches on the bikes’ kickstands. BMW seem to have fixed the design, as this never happened in 2012. 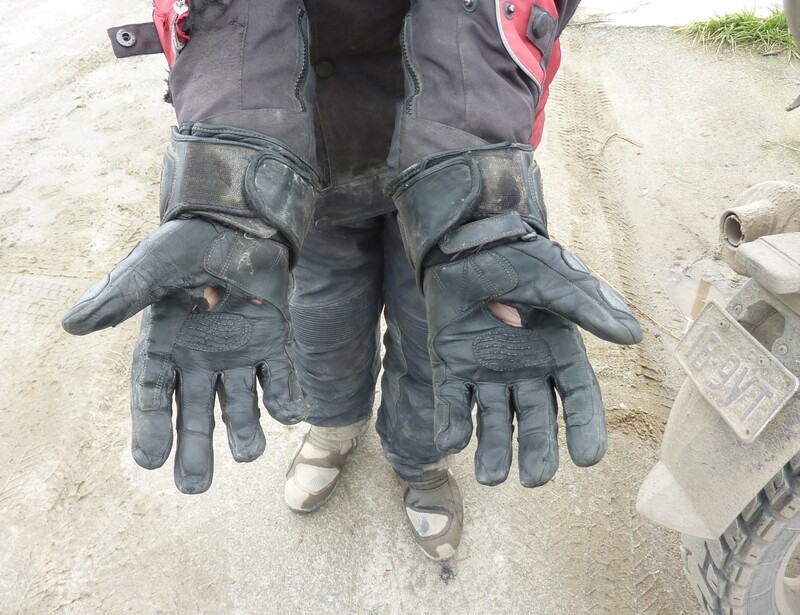 Here’s the handlebars – My gloves wore out, so that I acquired some of the stigmata of Jesus Christ. Cruise control – a bit of a luxury; it cost $1500 installed, and was very handy for long rides on good roads, like all across Europe, but not very safe to use if you’re in a group. I use it all the time when riding on my own in Australia; it allows you to take your right hand off the throttle and it makes the bike stick to the speed limits. You can’t use it on dirt roads, or around tight corners. GPS unit – a Garmin Zumo 660 – great when it worked (you can download the European/Russian maps into it) but worse than useless when it failed, which was every day. Mine had a hardware fault, and I found Garmin support to be condescending and useless; if I made the 660 play music it would freeze at random, and if I started it on the bike, it would immediately freeze until the battery was discharged (6 hours). I got the hang of starting it off-bike and then clipping it to the bike, but it let me down often and badly. By the time I got home, the warranty had run out and neither Garmin nor the shop that sold it would consider replacing it. GPS tracker – I did not have this, and only one other bike on the trip had it, but I reckon that one be compulsory for EACH bike on a long trip. With this $500 device on your bike, it is possible for anyone to track where you are ‘live’ on the Internet, which is very cute for those at home but even more handy for those on the ride, as the ride leaders can see where the bikes really are. One day in Romania, for example, we were scattered all over the country, which was risky if any bike had broken down. Cat Tracker – a little blue toy, 30x40mm which stores GPS positions every second or at longer intervals. It is weatherproof and stores 64,000 data points, enough for a few days. You have to plug it into a laptop to recover the data. This cost $70 and was intended for attaching to a cat or dog – you can find out where your pet has been (if it does not shake off the device, as my cat did, near the dustbins; so now I know that the cat goes there). This worked perfectly, and I recorded the entire 104-day trip by recharging it every night and carefully cataloguing the data. Helmet camera – I had the Contour sports camera, fitted to the bike rather than to my helmet, and I got a few good videos on Australian rides (and a video of a kamikaze pedestrian who stepped out in front of me after I had hooted, on approach to a blind turn). It was supposed to be waterproof, but the torrential Swiss and Austrian rains eventually penetrated it, and ruined it. The rival make is the Go-Pro; another bike had one of these, it performed throughout and I would recommend that, but generally, video is a lot of trouble and no end of work is required to get a watchable film out of the raw footage. Helmet loudspeakers – I fitted speakers into my Nolan helmet, with a Bluetooth connection to the dreaded Garmin Zumo. Apart from the Zumo freezing when I tried to play music, the speakers’ receiver was fiddly to operate and I had to take the speakers out when I washed the helmet – and wash it I had to, inside and out, 5-6 times. For both these reasons I ended up using a finger-size MP3 player with its own earbuds; this worked very well but on day 80 when I bent down to pick up a fallen motorcycle, my riding jacket tightened and the MP3 player in my pocket pressed against one of my ribs, and broke it. They make those MP3 players well … but honestly, why does life have to be so difficult? 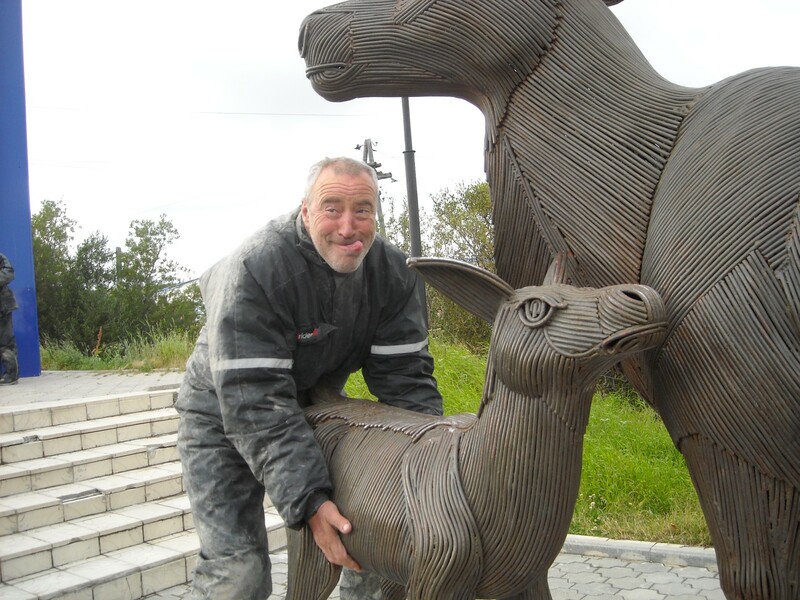 I enjoyed the music on the long rides, but at some places silence was appropriate – on rocky roads, on short rides, in wet weather (too fiddly to manage the cables) and I rode in a respectful silence all around Volgograd and on the Road of Bones itself, thinking of the millions who died there. You don’t just ride along the Road of Bones. 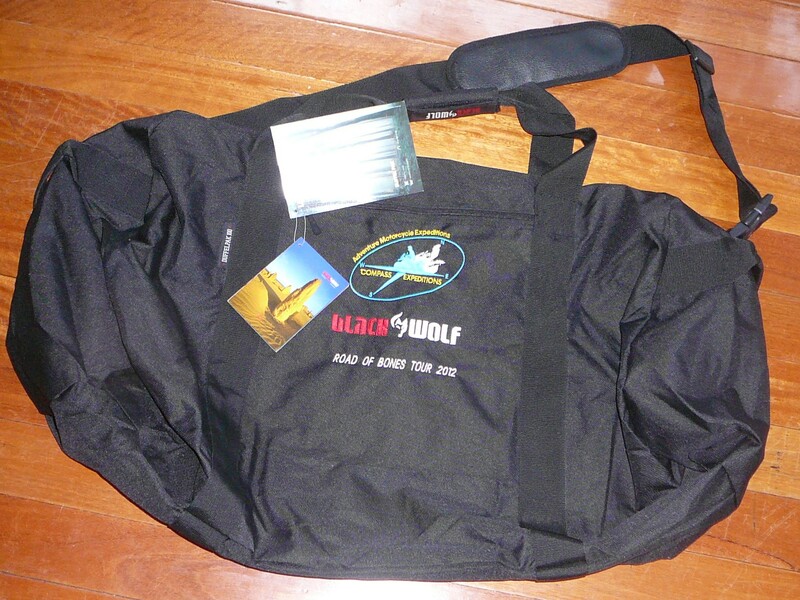 Camel Bak – most riders had the rucksack style, but I hate having a rucksack, especially over a heavy riding jacket, so I put my water bladder in the tank bag and took a swig whenever we stopped. Kazakhstan was up to 40 degrees of fierce sunlight, and we were all wearing black clothing, we stayed cool when riding but the water loss was unbelievable – we each drank 4-5 litres a day, and yet one of us nearly died due to dehydration (at a customs post – the border crossings took up to 5 hours). I found an ordinary 600ml Coke bottle, jammed under the back rail (see picture at top of page) would stay there holding water for weeks of rough riding. Air Hawk inflatable seat – very nice on the long rides, but your bum hardens and after a few weeks you do not need it. It is a bad thing on bumpy/rocky roads, as even when it is barely inflated you still lose some of the precious control over the bike, you are sitting a few mm higher and you slosh around on the seat. Laptop computer – essential for my sanity, as I live on the Internet. I brought my old Asus EEE which has a 7-inch screen and 80 GB disk, this was adequate for the whole 5 month I was overseas, together with a 1 TB hard drive for music and photo backups; I wrote the entire blog of the trip using it, and I still do (www.stevethings.wordpress.com) . I also had an iPad which was essential for translating to/from Russian and other languages, and showing maps and pictures of Australia, but it got seriously wet one night, and was ruined. The locals have iPads too, and when they get drunk they will show you their holiday pictures. Camera – I take a lot of pictures and I endure carrying a big clumsy DSLR, a Canon 40D, and I also use a small pocket camera. I brought a spare body and two spare lenses, and the body and main lens both failed towards the end of the trip, so my camera with its new body & new lens was like “grandfather’s axe”. The small camera got wet on day 101, and I threw it away. This was not a risk-free trip, and to get good photos you have to risk your equipment. People got very good pictures with iPhones and now that I have one too, I do not need another small camera. Credit card – I got a new card especially for the trip, but I never had any problem using it and no scams or loss of money occurred. ATMs were everywhere but they did not display in English, except in the big cities and tourist places. I carried about 2k in US dollars but rarely needed to change them. Use these maps and the SPOTWALLA tracker to follow us! You see in the colour map those vertical lines of longitude down through Yakutsk and Magadan? Well the lines are TEN DEGREES of longitude apart … and there is another line in between them. We rode across 20 degrees of longitude in 6 days – as far as Perth to Adelaide. RIDE STARTS in 12 hours! Yes there’s only 1 night to go, tomorrow morning our 15 motorbikes and two 4WD’s set out from the Ace Cafe in London, via the M25, M20 and Channel Tunnel train to Calais and finally Rouen, France. It will be a long day but we are all raring to go! In five days we’ll be in Budapest. Today we all went on an Off Road Riding course on Salisbury Plain. Unlike the course I did back in Melbourne, this one was on real dirt, real mud and real slippery slopes, with 250cc Kawasaki dirt bikes. I fell off at least 4 times, but was able to pick the bike up, however I have bruised a foot so now I will walk with a limp for a couple of days. But the course was very useful and great fun, and I learned a lot, including not to get your foot caught under the bike when it falls over! The motorbike arrived at Felixstowe and I went up in a bus with the other riders to collect it. 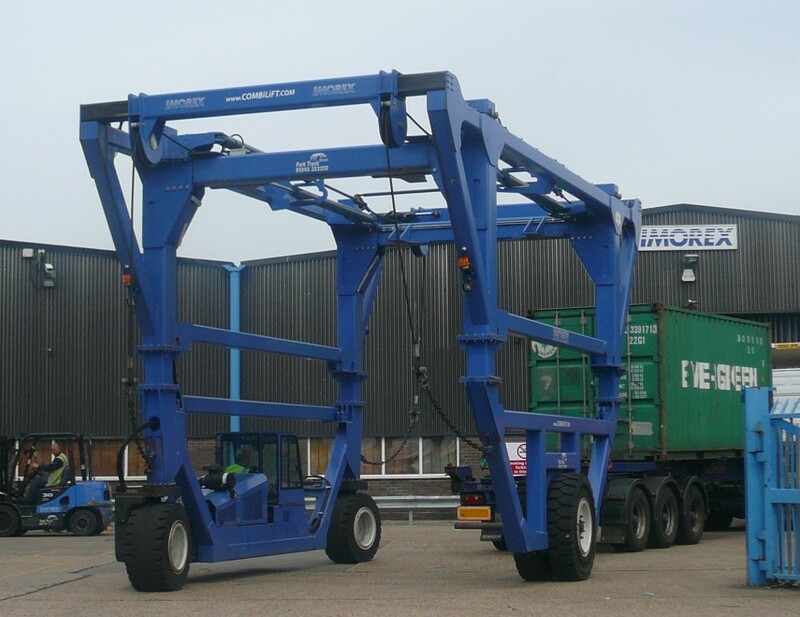 Here’s an ingenious 3-wheeled blue thing for lifting containers off lorries at the docks. My bike was third out of the container and it took only 2 minutes (but 3 blokes) to put the front wheel back on. Connected the battery and it started first swing! Drove it all the way to London – it all works, the cruise control works, the engine works, the music in the crash helmet works. My body however is a bit out of practice, I should have exercised the fingers, shoulders and the bum muscles. The GPS works, although the map (the version you get for free) is a bit old – it shows Londinium and Gaul, and the voice says “now turn left and drive the chariot XXV miles”. 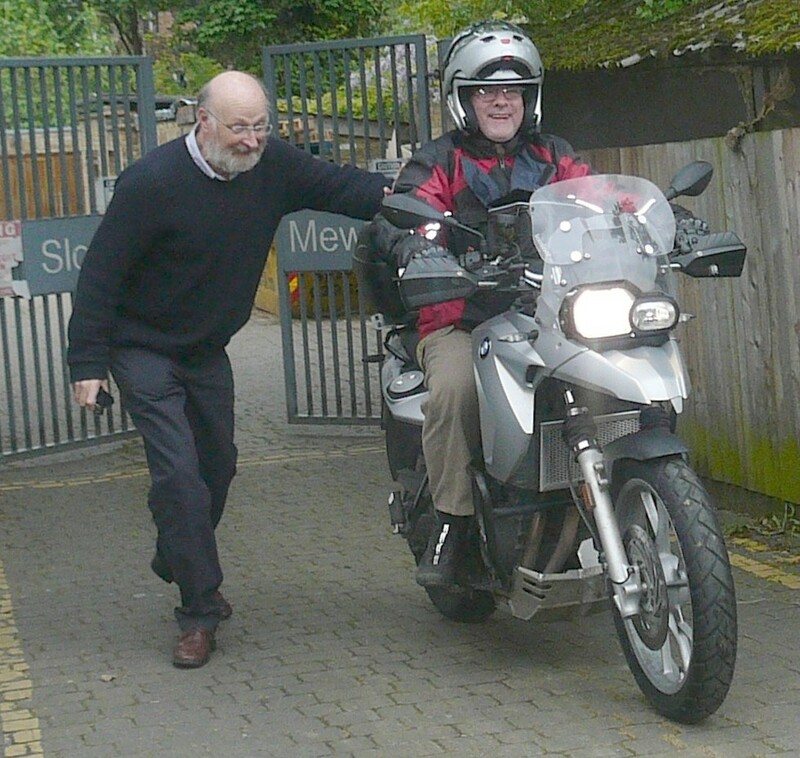 So here we go – here’s me posing with my trusty bike in its full travelling configuration, and me taking off with a helping shove from our London host. Barbro and me were at Land’s End a week ago, and in two days I leave this island at the other side – to cross another island from side to side. That one is called “Asia”. With the finest motorbike, the proper spare parts and the finest support from Compass Expeditions, this will be a wonderful trip. C’mon old friend … take me to Magadan! 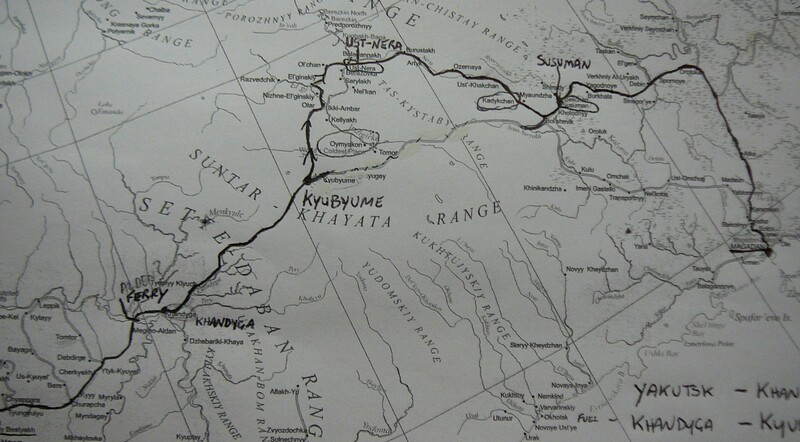 I’ve had to take a guess at some of the routes and in any case the route may change according to circumstances – the previous trip in 2010 had to frantically avoid going into Kyrgyzstan, due to a civil conflict. But as you see, we ride across Europe, across Turkey, ferry to Sochi in Russia then Volgograd and a little bit backwards to include Moscow, then just short of the Urals we go south to visit the ancient Silk Road cities of Tashkent, Samarkand and Bukhara, a spectacular lake and canyon near Almaty then back into Russia and we come up to Novosibirsk, near the right-hand edge of the map. At the left-hand edge of this half, at this point we will be about 65 days and 16,000 km into the trip. 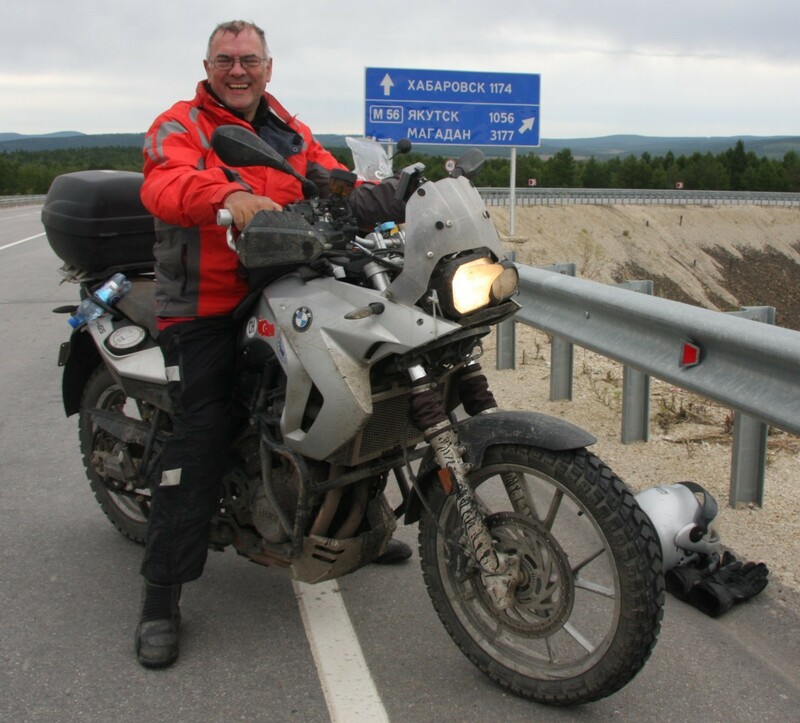 Carrying ever onwards – I do love motorcycling – we hit Irktusk, go down into Mongolia and do a loop there – pausing to buy a dinner for a friend of mine in Ulan Bataar – then eastwards along the M58 and sharply turn northwards (at a place called “Never”) onto the M56, Kolyma Highway. 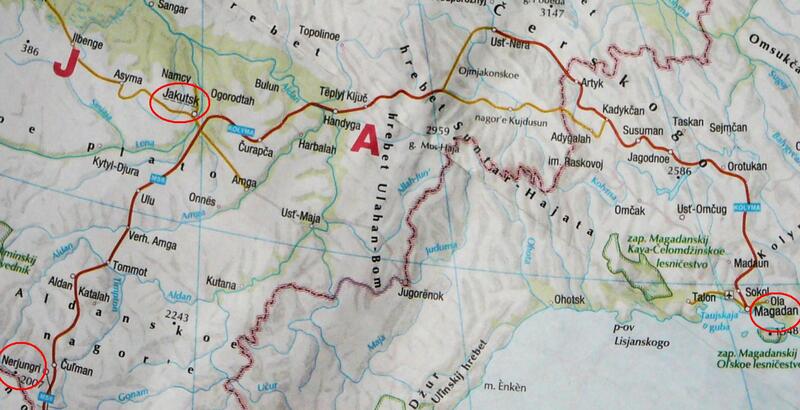 This executes a vast clockwise loop to come into Magadan; I’ll do a separate posting about that bit. 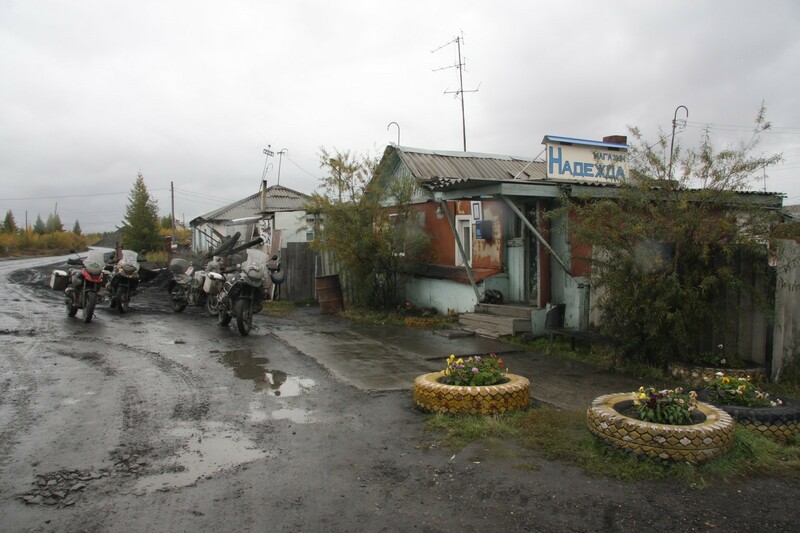 The road ends at Magadan, we ship the bikes out from there by sea, and fly home via Vladivostok. Good news today – my Russian Visa has come in, so I now have all the visas I need for the Road of Bones trip, which starts next week. Yes next week! I have started to count down in weekdays instead of whole weeks. Next Thursday (17th May) most of the riders go to Felixstowe to get our bikes off the ship. Friday 18th is the introductory briefing, Saturday 19th is an off-road riding course and from 0730 on Sunday 20th we ride off from London’s iconic Ace Cafe to Rouen, France!! Argh!!! Everything is in order, but I am still terrified, with pre-expedition nerves. The ride leader told me not to worry, as it will be a terrific trip. Of course “terrific” is roughly the same word as “terrified” … anyway I have now listed the itinerary in a separate page and I will try and draw a map, as well as list my own highlights of stuff I really want to see on the trip. I have booked to stay an extra week in Vladivostok at the far end, most other riders will go after 1 night. All riders have written emails introducing themselves, and as expected we are all shapes and sizes, from UK Australia or NZ, with one American and one Norwegian. Most of the bikes are BMW R1200GS, but mine and two others are ‘only’ 800cc’s. I did sit on the 1200GS in the shop, and I wanted to buy it, but it’s too high off the ground for a little bloke like me; the F650GS that I bought will be easier for me to pick up …. when, it, falls, over. Arrghhh!!! Let’s see how that one works at some of the eleven borders we’ll be crossing. They might fall for it in Uzbekistan. Oh dear. Perhaps I should have paid the extra and booked the de-luxe version of the journey … but on the de-luxe trip you probably get deeper despair, more days of starvation and extra fatigue. Finished packing, and we’re off to the airport in 45 minutes. We have 6 weeks in Britain (it’s snowing now & there is a petrol shortage – Strewth!) visiting rello’s and then on May 20 Barbro goes off for 3 months in Sweden, and I set off on the motorbike out of London! The trip will be hard work but all pretty safe, there will be 15 riders and Compass Expeditions are renowned for good leadership on long intrepid rides. All those cabbages … and reindeer … here we go! The marmots in Mongolia are said to be quite tasty, but they do carry plague so I’ll probably avoid those and go for the boiled sheep’s eyes instead. Please keep checking here every 2-3 days for updates. You can now also click near the bottom right of the screen & get an e-mail whenever I update it. But to return to Moreland, which is not much like Mongolia at all. A last visit to my favourite Indian grocer, where they have big tins of spinach useful in my attempts to lose weight and emulate Popeye, and they have those packeted Indian meals that you can microwave. Except this time there was no spinach, and no more of the $1 packeted meals with a line drawn on the packet to show they were past their best-before date, which I don’t mind because the food keeps perfectly for years (in 2005 I once found some food marked 1994 in a shop that was still edible, the food that is, or perhaps the shop would have tasted better; “best before – MDCCCLXVII”). I bought such sealed-food packets in a market once, and they were marked “Property of Indian Army” – good heavens, the Indian Army goes into battle on this stuff! Having been up there where the real Indian Army was, I can quite believe it – I cycled past a platoon of about 80 soldiers, all over 6 feet tall, with the best new equipment, marching off in a determined style to spend a week outside in the Himalayas at 5,000m. Anyway, in preparing my motorbike for the journey, there I was on the scrounge for a piece of aluminium and I was directed to an obscure barn in Moreland with no signage; it was full of engineering stuff – lathes, cutting and folding machines, overhead drills, you name it – a couple of oily blokes in there and they gave me a piece for free – a piece of aluminium that is. To the engineer who helped me and donated this, thank you! Using it, and some bolts from my favourite hardware shop … … I fashioned my own extension to my motorbike’s under-engine bash plate. In September I hope to be able to post a picture of what this looks like after passing over thousands of miles of Russian dirt roads. “to be able” because I may be stuck in Vladivostok for some days with the airport closed and all the hotels full. My favourite hardware shop is also in Sydney Road; today I said an emotional farewell to my friends there. It is the most amazing huge hardware shop, possibly the only one left that is just like they were in old times. For the telescope we were desperate for some 12-inch Imperial-gauge 3/8″ Whitworth bolts, and they had them right there (and, more usefully, upon the payment of some money they allowed us to take them away). More of my adventures in Moreland are on the back page of each issue of PHOENIX magazine, a fun read which tries to chart the progress of work on the Great Melbourne Telescope. Download all issues free from here. 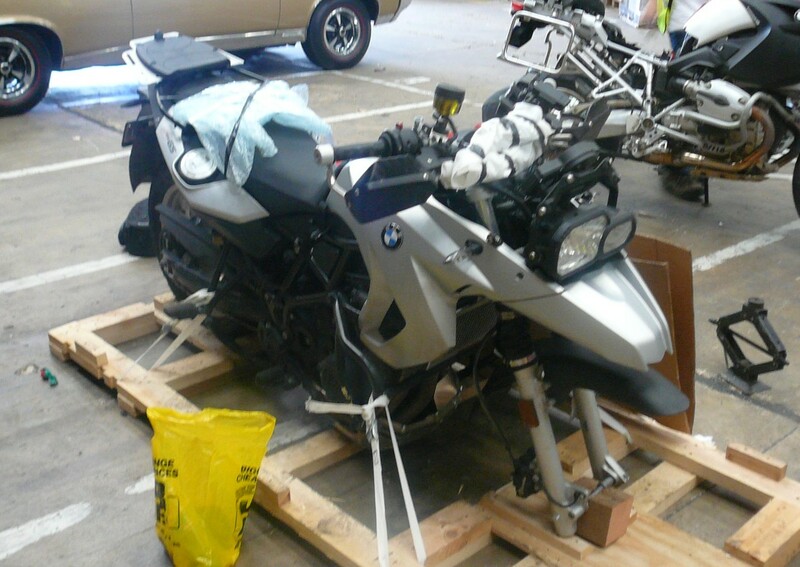 A sad farewell as the motorbike, with all accessories, tools, spare parts, and riding gear, gets packed into the container for shipping to London. Also being packed are the ride leaders’ 4WD and bike, which – as astute readers may notice – lacks some customary parts, such as a front wheel. Oh well. 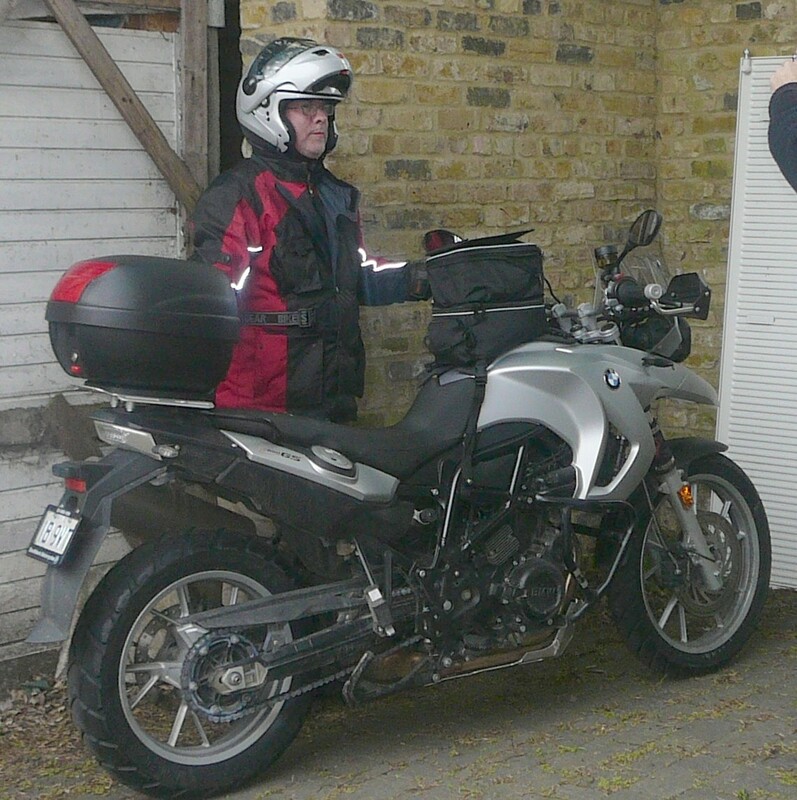 We’ll meet again in London on May 18th, me and my F650GS, and hopefully its front wheel too. I need it, to point at Siberia. These are quite big – 100 litres – but EVERYTHING for the 105-day trip has to fit into the two of them, except me and the motorbike itself. I think I will be sick of the sight of these long before we get to Magadan. I followed our proposed route on Google Maps. I could not see how to get from Chita to Skovorodino, where we will pick up the famous M56 (at a place called “Never”, would you believe). The tour company have done it before, following the M58, which is not marked on Google Maps. The good news is that on the “maps” display I was able to string together some marked roads to join up the two places. The bad news is that when I switched to the “satellite” display, there were quite clearly no roads there. Wikipedia says: “The Russian route M58 is a federal highway in Russia, part of the Trans-Siberian Highway. It runs from Chita to Khabarovsk … The most problematic stretch of the highway lies between Chita and Khabarovsk”. Went on an Off Road Riding course yesterday. The company is reassuringly called “Stay Upright” and they have some disused industrial land that you can ride your motorbike all over. Learned a number of useful things – how to ride on dirt and up and down hills, how to handle a skid, the relevance of looking where you’re going, and how to pick up your motorbike when it has fallen over. Nothing looks worse than a horizontal motorbike, especially a nice new one like mine. I hope I can remember the skills I learned at the random moments when I will suddenly need them.